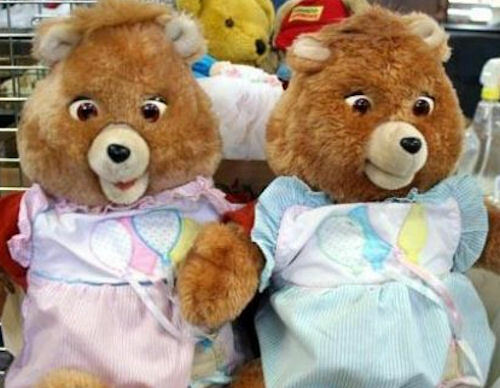 Weird Things » Blog Archive » 80 Teddy Ruxpins Become Creepy Voice of the Internet! The resemblance of the Hell scene from What Dreams May Come is uncanny. Just a bunch of body-less heads talking superficial nonsense (tried unsuccessfully to find scene on youtube). I actually really liked the exhibit. I wish I could get a chance to see it live. Very clever. I’m kind of wish he had done something with the board the dolls were on. Either make it less obvious (black paint, matte) or maybe lexan (clear plastic) to make it absent). I think visually as a piece it wasn’t as well thought out, or maybe he was conscious of his decision, who knows… still the background could’ve lent something to the whole of the display but he didn’t use it very well. It was creepy in that ‘uncanny valley’ way.